“American poets now usually do not seek to weave a comprehensive vision,” proclaims Mark Edmundson in his essay “Poetry Slam,” (Harper’s, July 2013). One may argue against this view, but how many have provided a Blakean-style vision in counterpoint? 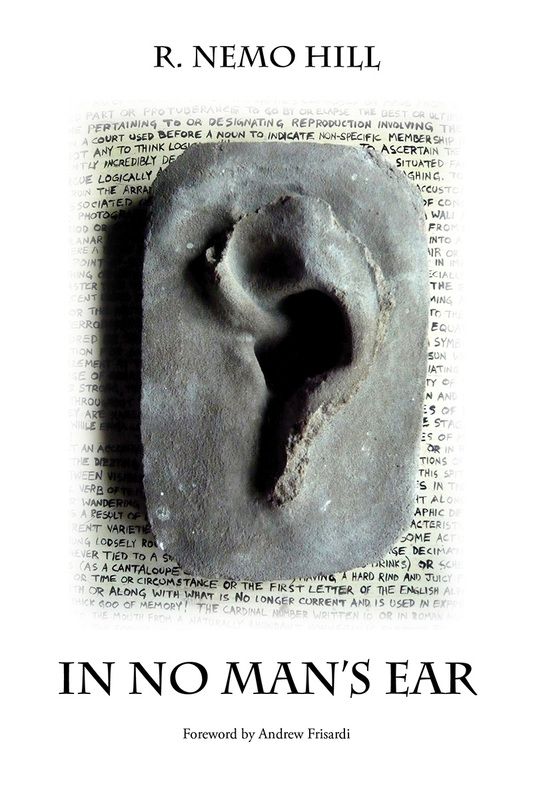 Coming from outside of the usual academic milieu, R. Nemo Hill, in his newest poetry collection, In No Man’s Ear, astonishes with irrepressibly visionary poetry, transforming apparent banalities into extraordinary worlds, giving the mundane details of contemporary life a greater context, charged with unexpected meaning. Visionary poetry must have both far-reaching scope and a touch of the cosmic; newness or originality alone is insufficient. Hill takes us there by revealing connections under the radar and marrying opposites: the mundane becomes sublime, the inaudible becomes transformative music, the lowliest act, such as sweeping, takes on cosmic significance. Hill’s first book was “an illustrated novel … organized according to the processes of medieval alchemy.” The word “alchemy” resonated as an apt metaphor for and key to these poems, which perform their own verbal transmutation of worldly observation, beautifully rendered, into transcendence—from lyric poetry to visionary epic. Here is the diametrical opposite of the ubiquitous first-person confessional. Even the poet as narrator vows detachment: “I creep around the edges of my night:// vampyr crepuscular.” (From “Murmuring Firmament, Wandering Fundament”) In “Man Attacks Wheel,” ten different points of view (all of equal line and metrical length) weigh in on one event where a deranged man attacks a moving carousel full of children—showing how multiple participants each redefine an event, whose cosmic significance is only grasped by a priest, making him like the poet-observer. The poet whose job it is to bring us the world and ourselves in a new, transformative light by imagining greater possibilities. And so in “Poseidon Elegy,” Hill posits a marriage of heaven and earth performed by the ocean’s sound, a “fundamental trembling that forever binds/ All things above to all that heaves beneath.” In “The Banyan Tree and the Bathers,” he transmutes a street scene into a cosmic “force”: “Ruled by a chaos almost musical in form,/ a cadence crude yet intricate—controlled, and yet insane—/ mechanical, yet human in the eye of its own storm,/ the street here blooms and bustles with a force that cannot be contained.” That force, “almost musical in form,” relates to sound. Not unlike the sea. We find a more irreverent perspective in “My Corpse,” vigorously flaunting death with imperatives: “Grant my corpse all number,/ lend it every name—/ then hurl it from the window/ of any speeding train.” Yet even here, all and nothing are joined: “all number…every name” are given to the corpse while simultaneously desecrating it. to slow approaching dusk, its touch, alone. a music draws breath from the vanished wound. such trembling, and such stillness, thus attuned. that constancy that drives men mad: to be. The word “psalm” suggests a religious element, and the birdsong itself is highly symbolic, with too “high” a pitch, out of the normal range, suggesting again the supernatural, even angelic or divine. A very different vision from Blake’s, but equally religious in the deeper sense, visionary and imaginative. The author’s name “Nemo” means “no man” in Latin, a fact he incorporates into his vision, and even in his author’s photo, where he is blurred out except for the ear. As the name of Jules Verne’s character in Twenty-thousand Leagues under the Sea, “Nemo” is also a sailor, appropriately for the poet Nemo whose extensive travels through Southeast Asia (he keeps a travel blog) and elsewhere figures in many of his poems, as does a Melvillean sense of the nautical. A hapless sailor meets adventure in “The 50 Commands of the Nereids”, a wild dramatic takeoff on Greek plays, wherein a Nereid gives him (Odysseus re-tortured) impossible, capricious, and sometimes humorous commands to the delight of a chorus of other Nereids. The archaic and contemporary meet: “I’ll have the Simple Foam that’s born anew each moment in the surf.” It’s an entirely alien underwater world in the same sea elsewhere referred to as “a vast inanity”(“Godless Sea Goddess”) The sea becomes sacred yet irreverent, both immutable solace and present danger. a far scar of slower tone, of lower pitch. With a foreword written by renowned Dante scholar Andrew Frisardi, Dante being the ultimate visionary poet, this book clearly bucks the trend in modern poetry not only in terms of style – formal more often than free verse – but also of content, giving us a sense of myth and epic rather than the personal quasi-confessional poetry one finds everywhere. This is not merely a “collection” of poems, but rather a book to reckon with, a force of poetry that blasts preconceptions about “formal verse”, and to which one returns the way one returns to the sea: for its ineffable sound, its transformative power, and its sensous vision just beyond one’s grasp. Siham Karami lives in Florida and co-owns a technology recycling company. Her poems have been published in The Comstock Review, Able Muse Review, Measure, Mezzo Cammin, Think, Naugatuck River Review (as a contest semifinalist), Sukoon Magazine, The Turnip Truck(s), Alabama Literary Review, and Peacock Review, among other venues and anthologies; reviews in American Book Review, The Rumpus, thethepoetry, the Gay and Lesbian Review, and elsewhere. A three-time Pushcart Prize and twice Best of the Net nominee, she blogs at sihamkarami.wordpress.com.